book |bŏk| noun - a written or printed work consisting of pages glued or sewn together along one side and bound in covers. The Chicken Pox Christmas is based on a true story—a whimsical tale that stirs up heart-warming memories of a childhood Christmas. Jim Ed Hardaway brings this book to life with a comical story and colorful illustrations. Get your magical copy* and give one to a friend this holiday season! **FREE SHIPPING FOR U.S. ORDERS ONLY! Hurricane Ghost Story is the hauntingly funny book about a group of kids toying with mischief in the dark, echoing hallways of an old church, during a violent coastal storm (based on a true spine-tingling childhood adventure). This ghostly tale comes alive with vivid pictures and witty characters! Get your spooky copy* by Jim Ed Hardaway today! **Pricing includes *FREE SHIPPING FOR U.S. ORDERS ONLY. Select “Buy Now” and enjoy a secure purchase through PAYPAL. (*Offer only valid for orders shipped within the 48 contiguous United States. Shipping rates apply for ALL international orders and can take up to 3 weeks for delivery. An invoice will be sent to cover these shipping rates/costs). Will usually ship within 5-7 business days of receiving full payment. CONTACT for questions. 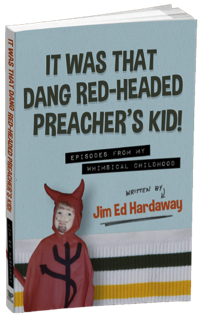 It Was That Dang Red-Headed Preacher’s Kid • Episodes from My Whimsical Childhood is a collection of memoirs from Jim Ed Hardaway's childhood—twenty-five entertaining chapters about growing up as a preacher's kid in the peculiar culture that is South Texas. 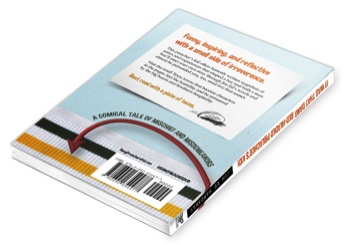 Between the covers of the book is a comical tale of mischief and misdeameanors—packed full of curiosity, pop culture, tribute, and surprises. From the hysterical Valley Girl Talk and Sunday School Prostitutes, to the heart-warming The Preacher, to the quirky Beetle Mischief, to the highly motivating Born To Rerun, the book is a mixtape of laughs, inspiration, and nostalgia. So, pause your Huey Lewis and the News cassette, kick off your checkered Vans, sit back in your bean bag chair, and enjoy the best thing since striped tube socks.